I'm not surprised that my knee is still bothering me from Saturday's race. My sneakers should have been replaced miles ago and I hadn't given myself much (if any) rest time in between runs. Hopefully the pain goes away soon so I can resume running in time for a 5k race in the next few weeks. Today I opted out of running (I may take a walk later on if Mason requests it) and decided to bust out my "30 day Shred" DVD. I started the 28 minute DVD as soon as I put Mason down for a nap. I set up the baby monitor next to my laptop and worked out while keeping a close eye on him. 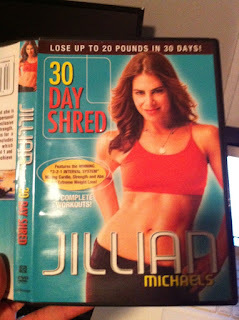 I may invest in another work out DVD since this proves to be the easiest way to work out while being a stay at home mom. Day #18 of my work out streak!